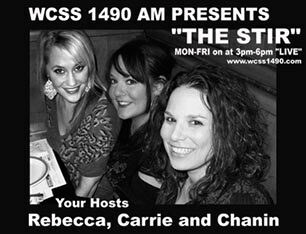 THE STIR The Original Radio Show was created by Chanin Leo in 2008. The show was originally produced as a SOLO radio show for Chanin, but she revised a 2nd show to bring on her childhood friends. 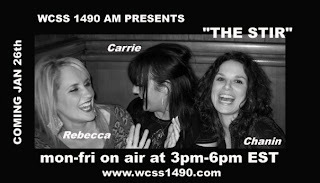 It was pitched and sub contracted on at WCSS AM 1490 Amsterdam NY in Jan of 2009 until April of 2009.. THE STIR Starred Chanin Leo, Carrie Barbato and Rebecca Cushing Persico. The show aired in Jan of 2009 in Amsterdam NY at WCSS 1490 AM. It was a Story of 3 childhood friends now a team of dynamic women from Amsterdam, NY who grew up as children together and as adults came back together with new experiences and cultural backgrounds discussing the most exciting events of the day featuring Celebrity Guest Stars Sports and Political Figures Local to Worldwide. Due to popular demand with a larger audience, Chanin Leo and Carrie Barbato went onto to further their careers starting www.KarmaRadioNetwork.com alongside Producer Deita Klaus and Leo Dynasty Productions. These select shows of THE STIR that are aired are the chosen few of Celebrity Guests Stars booked by The Stir's Producer Deita Klaus. Enjoy rare and unique interviews from a Popular and Fast Famed Original Radio Show THE STIR. THE STIR the original radio show was created by Chanin Leo in 2008. Chanin Leo brought on her Co Stars as a unique way of celebrating their childhood friendships growing up in Amsterdam NY. All other THE STIR internet and radio shows are liable as this is a trademarked and copyright show under the ASCAP Publishers Talamasca Music ASCAP and Leo Dynasty Productions ASCAP.